Free Shipping Included! 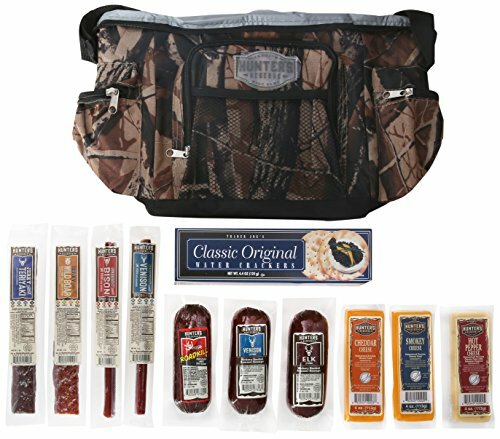 Hunters Reserve “Wild Game” Camo Cooler Bag with Assorted Premium Meats & Cheeses, 50 Ounce by Hunters Reserve at 365 Days Of Kindness. Hurry! Limited time offer. Offer valid only while supplies last. Hunters Reserve “Wild Game” camo cooler bag is filled with premium meats and cheeses all packed in a 12 can soft sided collapsible camo cooler. Hunters Reserve “Wild Game” camo cooler bag is filled with premium meats and cheeses all packed in a 12 can soft sided collapsible camo cooler. The perfect gift for any hunter, outdoorsman and outdoor women who appreciates the taste of wild game meats while enjoying their favorite cold beverage. The camo cooler bag features adjustable padded shoulder strap, 3 exterior zipper pockets, and 1 mesh exterior pocket with large zippered top opening, 12 pack capacities, and measures 12 x 8 x 10 inches. The perfect gift that keeps on giving even when the goodies are gone! SEABENEFIT Sand Fish Sea Cucumber - Wild Caught Sea Cucumber Dried All Natural Nutritious - 8 oz. SEABENEFIT Mexicana Black Large - Wild Caught Sun Dried Sea Cucumber All Natural Organic - 8 oz.